This is a delightful collection of poems. Moving through her own history now, Anna presents poetry on family life, connections and her time in Mid-west America. The final poems refer openly to her mother’s illness and all the moments that have breezed along in the earlier poems seem all the more poignant by the end of the book. I love the way she speaks to the people in her life through these poems with many ‘characters’ appearing in dedications again and again. 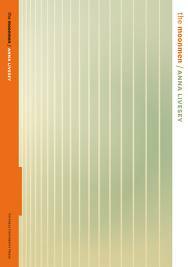 Where Anna’s debut, Good Luck, felt like the clever work of an academic mind, this collection feels satisfyingly personal and reflective.